Composable Nomination Cashmere charm. Carry your love with you, thanks to this bright and beautiful heart charm. 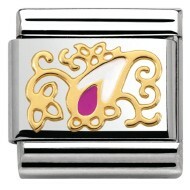 Crafted from coloured enamel and 18kt gold, this charm is part of the new Cashmere collection from Nomination. 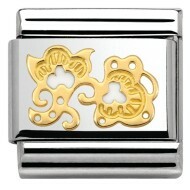 The paisley style of this charm will bring a breath of fresh air to your composable bracelet. Composable Nomination Cashmere White & Fuschia Drop Charm. Carry your love with you, thanks to this bright and beautiful heart charm. 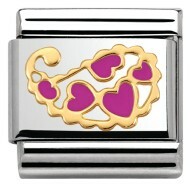 Crafted from coloured enamel and 18kt gold, this charm is part of the new Cashmere collection from Nomination. The paisley style of this charm will bring a breath of fresh air to your composable bracelet. Composable Nomination Cashmere White Flower Buds Charm. Carry your love with you, thanks to this bright and beautiful heart charm. 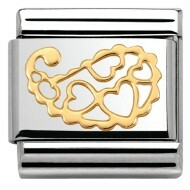 Crafted from coloured enamel and 18kt gold, this charm is part of the new Cashmere collection from Nomination. The paisley style of this charm will bring a breath of fresh air to your composable bracelet.